Earlier this month more than 80,000 litres of suspected illicit fuel was seized following a three-day operation by HM Revenue and Customs (HMRC). Officers temporarily closed four petrol stations in Leeds, Motherwell, Cowdenbeath and Hillington for three days after discovering about 73,000 litres of fuel thought to be illegal. Two vehicles were also seized in Loanhead, Midlothian, along with a further 7,000 litres of suspected illicit fuel. The estimated duty loss of all the seized fuel is about £56,000. A 30-year-old man from the Crossmaglen area of County Armagh was arrested in Leeds and brought to Scotland for interview. He has been released pending further investigation. 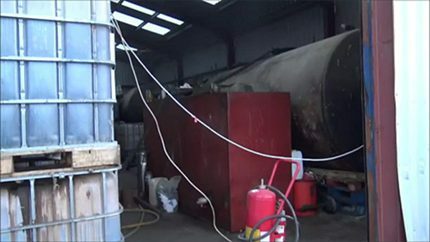 The seizures and arrests follow a suspected fuel laundering plant in Northern Ireland which has been dismantled by HMRC officers. Two men were arrested and the plant is thought to have the potential to produce more than 10 million litres of illicit fuel every year. Joe Hendry, assistant director, Fraud Investigation Service, HMRC, said: “Fuel laundering is unregulated and dangerous. Illicit fuel is sold at reduced prices and motorists may think they are getting a good deal because it is cheaper. I would caution them to think again as the true cost is far from a bargain. HMRC declined to identify the four sites where the fuel was seized.